As Senator Bernie Sanders barnstormed the Midwest, progressive Democrats started to believe that he might actually have a chance against Hillary Clinton. This story first appeared in the Burlington, Vermont-based newsweekly Seven Days, which is chronicling Senator Sanders' political career from 1972 to the present at BernieBeat.com. 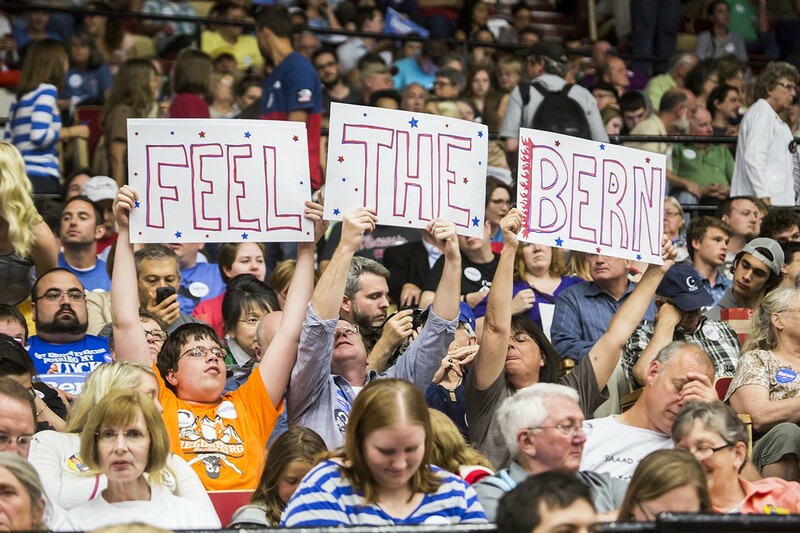 Like Bernie Beat on Facebook for the latest on the campaign, or follow Bernie Beat on Twitter. As the summer of 2015 began, US Senator Bernie Sanders, I-Vermont, became impossible to ignore. On July 1, as 10,000 people cheered and chanted his name, the 73-year-old senator summited a stage in a Madison, Wisconsin arena and took his place behind a wooden podium. He raised his right arm to wave at a sea of supporters and embraced his wife, Jane, with his left. Then, peering up at the distant nosebleed seats, Sanders did something unusual: He grinned. "Whoa," he said. In the 43 years since Sanders first ran for office, skeptics have doubted him at every turn. They never believed he could serve as mayor of Burlington, defeat an incumbent congressman, or chair a senate committee. Well before he entered the presidential race in April, Beltway pundits had long since written him off as an also-ran — a latter-day Dennis Kucinich. 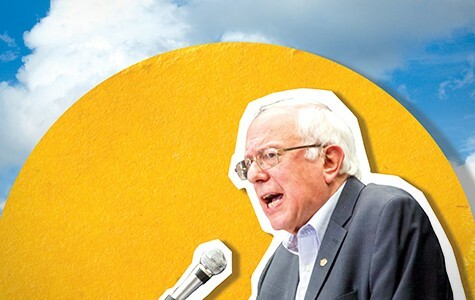 But by the time Sanders arrived in Madison at the start of a three-state, four-day tour of the Midwest, CNN had declared it the "summer of Sanders." By the time he departed, new polls and fundraising reports showed him gaining on Democratic front-runner Hillary Clinton. And in perhaps the clearest validation, reporters who'd been asking Sanders about Clinton in every last interview started asking Clinton about Sanders. At Wisconsin's Veterans Memorial Coliseum, the senator let loose a few more "whoas" as he scanned the crowd of mostly white faces holding blue and white "Bernie" signs. "In case you haven't noticed," he said, "there are a lot of people here." He grinned again. But Sanders' smile quickly faded. As he launched into an hour-long stump speech, any hint of optimism was supplanted by his dour assessment of modern America. The economy, he said, was rigged by greedy billionaires more interested in tax breaks than in feeding hungry children. Republicans held a "warped view of family values" and had "gotten away with murder for too many years." His opponents would exploit a corrupt political system to defeat him, while a shallow news media treated the democratic process like a popularity contest. "The greed of corporate America and the billionaire class has got to end, and we are going to end it for them!" he shouted. "Ber-nie! Ber-nie! Ber-nie!" the crowd chanted. No matter how Sanders fares in the nation's never-ending presidential tryouts, this was the moment his campaign became real. No candidate to date had attracted so many supporters under one roof, as the senator himself triumphantly observed. "It's clear to us that there's something going on out there," said Sanders campaign manager Jeff Weaver. In the nine months since we last traveled through Wisconsin and Iowa, the mood had changed entirely: Democratic activists were no longer pining for US Senator Elizabeth Warren of Massachusetts, and a surprising number said they were convinced Sanders could — and should — win. "God knows the nation needs him," said Donna Butler, a retired church secretary from Madison, whose husband died in Vietnam. "The nation is going downhill real fast. We just need this man." No candidate to date has attracted so many supporters under one roof. But with success comes scrutiny. A super PAC allied with third-place Democratic rival Martin O'Malley, the former Maryland governor, had already trained its sights on Sanders, airing a negative television ad focused on the Vermonter's mixed record on gun control. And now that Sanders has gotten Clinton's attention, he's sure to face incoming fire from perhaps the most formidable campaign apparatus ever assembled by a nonincumbent presidential candidate. "I think they're going to recognize that the support for Bernie is real — that in places like Iowa and New Hampshire, he can succeed because he's got a very powerful message," Sanders senior strategist Tad Devine said of the Clintons. The real test for Sanders is whether he can withstand the scrutiny, scale up his fledgling organization and keep the energy alive. It's a long road to the Iowa caucuses next winter and a longer road still to the Democratic National Convention next summer. But Sanders, a former long-distance runner, has been training for this race all his life. His sneakers are laced — and he's ready to run. Sanders should've been pleased the next day when he reached Fort Dodge, Iowa — a 25,000-person town with an economy based on corn and gypsum. This was, after all, one of the most successful weeks of his three and a half decades in office. After filling the Madison arena the night before, he had lured six hundred people to a breakfast speech that morning in Rochester, Minnesota. Hours earlier, Quinnipiac University had released a new poll showing that he'd more than doubled his support in Iowa in the previous month, from 15 to 33 percent. And his own campaign had announced he'd raised an impressive $15 million in his first two months in the race. Despite the good news, the senator sounded like he had an ax to grind. He repeatedly ripped into the news media that afternoon during an eighty-minute town hall meeting in an auditorium at Iowa Central Community College (ICCC). "The media regards politics as either a baseball game or a soap opera," he began. "And the baseball game is who's winning, what are the polls today, how much money did somebody raise? The soap opera is what happened in your life 87 years ago, this, that, and the other thing." It's possible the senator was bent out of shape over a story The New York Times was about to publish on his writings in the Vermont Freeman newspaper in the early 1970s. In one essay from that era, according to The Times, he suggested that cancer might be caused by unresolved hostility toward one's mother or having too few orgasms.